SCVHistory.com | SCV Leaders Seek Secession from Los Angeles County Over Garbage Issue, 1950. SCV Leaders Seek Secession from L.A. County Over Garbage Issue. The Newhall Signal | Thursday, February 16, 1950. You might know the Santa Clarita Valley voted in 1976 and again in 1978 to secede from Los Angeles County. (It didn't happen because rest of the county refused to let us go. SCV taxpayers were subsidizing county services rendered elsewhere.) But did you know it wasn't the first time local leaders pursued that goal? A quarter-century earlier, the SCV was starting to reek. Back then, what we know today as sanitary landfills were hog farms. Hogs ate and "processed" food waste from restaurants after it was allowed to "age," i.e., ferment. For health reasons (such as trichinosis outbreaks in the 1930s; read more), L.A. City municipalized garbage service, so the independent operators had to truck their garbage elsewhere — like the nearby Santa Clarita Valley. By 1950, the locals had had enough. Movers and shakers such as home developer Bill Bonelli, school superintendent Lester Dalbey and Signal editor Fred Trueblood Sr. were looking to break from L.A. County and join the much smaller county of Ventura where they believed their voices would resonate louder. As Trueblood saw it, "Soledad Township (the SCV) belongs to Ventura County by every geographical, political, economic and social criterion. In uniting with Ventura County we believe we would be happier, and we know we would be safer." It was not to be. The hog farms came, and as the state got wise to the health effects, they gradually evolved into sanitary landfills. Meanwhile, additional threats from L.A. City and County such as a plan for a toxic waste dump in Canyon Country and a state prison in Saugus kept the fires burning for "local control" and, eventually, cityhood. Coincidentally, the hog farmer whom local property owners were trying to stop in one of these 1950 news articles would come back to haunt the SCV in the 1990s when his company was fixed to build and operate a massive landfill in Elsmere Canyon. By that time Santa Clarita was a city. Had it not been, the outcome might have been quite different. Secede from Los Angeles County, Is Proposal. Ventura men welcome idea of taking over 2 northern townships. The Newhall Signal | Thursday, February 16, 1950, pg 1. 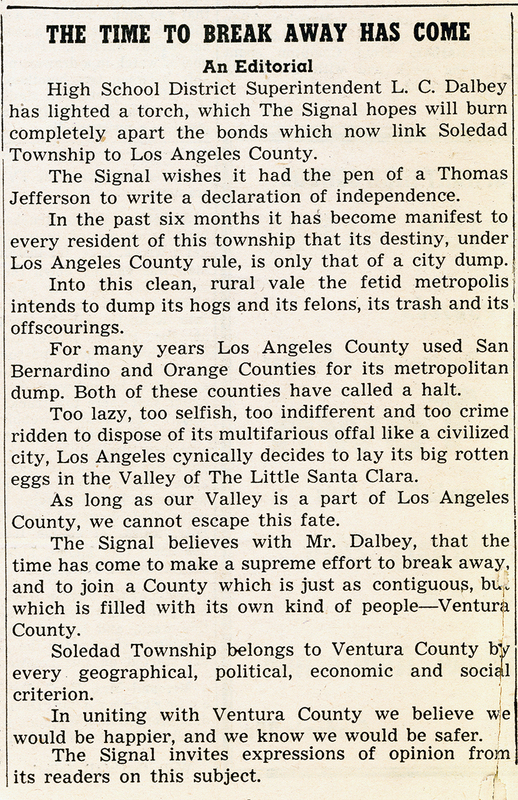 A possible escape from the fate of being the general dumping ground for metropolitan Los Angeles came to light this week by the publication in the Ventura Star Free Press of correspondence between Lester C. Dalbey, District Superintendent of Hart High School, and Commander Cooke, assemblyman from Ventura County. Supt. Dalbey queried Assemblyman Cooke on the procedures necessary to annex Hart High School district and Antelope Valley district to Ventura County, the practical effect of which would be to break off the northern two townships from Los Angeles County and unite them to Ventura. Dalbey pointed out that the two high school districts, if added to Ventura county, would bring $57.9 millions of assessed valuation to Ventura county, more than 21 percent advance over the county's $228 millions. It would increase the county's population about 20 to 25 percent. In his letter to Cooke, Dalbey told the Ventura county legislator that the Los Angeles county board of supervisors has ignored the wishes and protests of the citizens of the Hart and Antelope districts by permitting numerous garbage-fed hog ranches to be established in the area. "A number of us are very much perturbed over the Los Angeles county board of supervisors granting permits for garbage-fed hog ranches in our midst," he said. "Garbage taken to the hog-ranches," Dalbey wrote, "passes through our community and morsels of this rotten swill often leak or drop from the trucks. It is said some 70 or more large garbage trucks will pass through our area daily within a short time, loaded with the garbage from Los Angeles city. "We feel if it is possible to be annexed to Ventura county, we would have enough influence with the Ventura county board of supervisors to have all garbage-fed hog ranch permits in our area revoked, as our population would be a fourth or a fifth of the entire population of Ventura county and we would have approximately 20 percent of the assessed valuation." Dalbey expressed suspicion of Los Angeles county's influence over California state affairs generally and said it was possible many state legislators shared this suspicion. "I wonder," he wrote, if brought before the state legislature, would not receive support of the most of the state legislators outside of Los Angeles county." Assemblyman Cooke said today he was going to take immediate action to learn what could be done about annexation. He said he did not blame the Los Angeles county group for wishing to join Ventura county and he expected to confer with legal and school authorities, including County School Supenintendent Dean Triggs, as soon as possible. He may also take the matter up with the attorney general. Under the government code of 1947, the annexation could be accomplished by vote of both boards of supervisors of the two counties involved. The respective boards must be petitioned by 25 voters of each county with a statement of the proposed change of boundaries signed by 50 percent of the land owners in the area. If the petitions do not violate boundary laws and are verified, the supervisors can grant the change and effect the transfer, Deputy District Attorney Julien Hathaway said today. If either board refuses to grant the change, after proper preliminary steps, Hathaway indicated it would probably be necessary to resort to court action. Supt. Dalbey informed The Signal he had acted with the full knowledge and consent of members of the Board of Trustees of the District. He also disclosed that he had sent a letter of the same nature to Assemblyman Julian Beck at San Fernando. Assemblyman Beck replied pointing out that state law practically nullifies any possibility of forming new counties, but taking no position on the leaving one county and joining another. THE TIME TO BREAK AWAY HAS COME. Fred W. Trueblood Sr., Editor and Publisher. High School District Superintendent L.C. Dalbey has lighted a torch, which The Signal hopes will burn completely apart the bonds which now link Soledad Township to Los Angeles County. The Signal wishes it had the pen of a Thomas Jefferson to write a declaration of independence. In the past six months it has become manifest to every resident of this township that its destiny, under Los Angeles County rule, is only that of a city dump. Into this clean, rural vale the fetid metropolis intends to dump its hogs and its felons, its trash and its offscourings. For many years Los Angeles County used San Bernardino and Orange Counties for its metropolitan dump. Both of these counties have called a halt. Too lazy, too selfish, too indifferent and too crime ridden to dispose of its multifarious offal like a civilized city, Los Angeles cynically decides to lay its big rotten eggs in the Valley of The Little Santa Clara. As long as our Valley is a part of Los Angeles County, we cannot escape this fate. The Signal believes with Mr. Dalbey, that the time has come to make a supreme effort to break away, and to join a County which is just as contiguous, but which is filled with its own kind of people — Ventura County. Soledad Township belongs to Ventura County by every geographical, political, economic and social criterion. In uniting with Ventura County we believe we would be happier, and we know we would be safer. The Signal invites expressions of opinion from its readers on this subject. Property owners sue to kill Saugus hog permit. The Newhall Signal | Thursday, February 16, 1950, pg 4. Fifteen owners of property in the Newhall-Saugus area Wednesday asked the Superior Court to review proceedings which resulted in the granting of a hog-raising permit by the Board of Supervisors. The petitioners, joined by the Boquet Canyon Water Co. [sic], filed their suit against the Supervisors, the County Regional Planning Commission, Saugus Feeders Inc., and Ben K. Kazarian, managing executive of the concern. Members of the Board of Supervisors, according to the petition, granted Saugus Feeders a permit to raise 15,000 hogs on approximately 320 acres last Jan. 10. The petitioners contend that the board exceeded its discretionary powers. The complaint recalls that Saugus Feeders originally asked for a permit to maintain 100,000 hogs on 8,940 acres and that a county zoning board turned down the request last Sept. 19 on the grounds that the project, involving use of garbage, would be injurious to public health. Later, the petition adds, the Supervisors instructed the zoning board to conduct a new hearing and on Dec. 2 the board recommended granting of a permit limiting the enterprise to 10,000[?] hogs on 320 acres. The petition charges that the Supervisors then raised the limit to 15,000 in granting the permit. The court is asked to review the entire proceedings and declare the permit invalid.